Many of the great inventions of life are received as brilliantly simple, this to the point that we might ask ourselves how did ‘I’ not think of that. The umbrella, Velcro, the mirror, or even bottled water are samples of this truth. 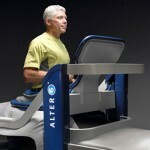 Without doubt, the Alter G anti-gravity treadmill falls into this category of a simple idea brilliantly executed. The science of ‘movement free of gravity’ is of course not a new one, the use of a basic baby-walker to aid a baby in movement and allow for the building up of muscle strength is such an example. Exercising in the swimming pool also aids people to rehabilitate injuries and allows exercise without overloading joints; however, this minus gravity approach has its limitations, as the pool only offers one level of gravity. We are also aware of the use of parallel bars in hospital rehabilitation of patients who are unable to weight bear due to illness or accident, the advancement on this method is the harness where the therapist controls how much weight the patient bares by hoisting or lowering the controlling cable, a very cumbersome therapy. 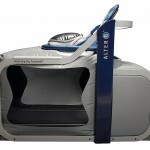 The Alter G anti-gravity treadmill is at the pinnacle of this mode of therapy due to its technical ability to take a person to as much as minus 80% gravity and this in 1% increments of their body weight. This single % control by the Alter G is unrivalled characteristic which not only allows for speedier rehabilitation but also for an earlier entry into rehabilitation.